I recently posted an article on how to involve Millennials in your benefit auction. (It’s almost prerequisite reading for this post.) Today you get to see a Millennial in work, and — further bonus! – how it ties into a recent LinkedIn conversation I’ve been following. He’s been helping with some of my company’s social media outreach, videos, and one-off projects. He’s merging his event planning skills with fashion. 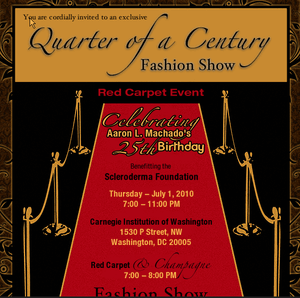 Perhaps it’s no surprise that given his interests and age, his 25th “Quarter of a Century” birthday is a huge bash to raise money for The Scleroderma Foundation. Oversaw marketing, signage, A/V, etc. Given Aaron’s professional approach, you might be stuck for an answer on this next bit. Interesting article in this week’s Crain’s Detroit Business by Sherri Welch. It’s all about young professionals who have started sponsoring charitable events designed to attract younger donors. They’ve used Facebook and branded this type of fund raising as “Party with a Purpose.” While the events sited in the article have been successful, most are unsolicited. 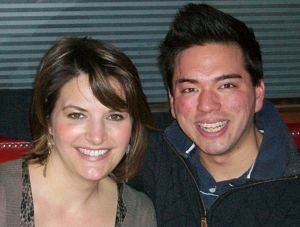 Michelle asked: Should charities become more flexible to allow these types of events in order to attract younger donors? In Aarons’ case, he called The Scleroderma Foundation, explained what he wanted to do and why, and they lended him the use of the logo. The charity didn’t have any third-party fundraising guidelines, so Aaron had free reign. He’s running this in a top-notch way so the charity should be nothing but excited. But I could imagine that in some cases, a fundraiser could go wrong. In such a case, the image of the charity could be tarnished in the process, even though the charity had nothing to do with the function — other than their name being used. I know that if my company logo was being broadcast, I’d want to have some confidence in how it was being used. Do guests wear costumes to your auction? Here’s a coupon. I think it is important to partner with the charity that you want to support. Overall it is better for the cause in the long run. I am presently doing a fundraiser for an organization called “Faces of Tomorrow”. When I contacted them they were so excited – they posted about the fundraiser on their website and even did an email drop to help support my efforts! I like that you use the term “partner”, Kelly. I think approaching the event as a partnership between the organization and volunteer will always result in a win-win. Best of luck to you on your fundraiser with “Faces of Tomorrow”. We have a cause that is not all that appealing to young people – caring for the elderly. To make a broad generalization: they think old people are, at best, boring. Baby boomers and older “get it” because they’re dealing with their own aging parents. Any thoughts for engaging younger people?